Where can I buy that?? The first time I started to get that question was right after I posted my daughter-in-law’s recipe for Gallo Pinto. Her recipe is, in my not too humble opinion, the absolute hands-down best I have had anywhere in all the years I have lived here and the years before when I was a visitor. She got the recipe from her mom and who knows before that… but it is superb! Those of you who know me are aware perhaps that I am not exactly an amateur eater! 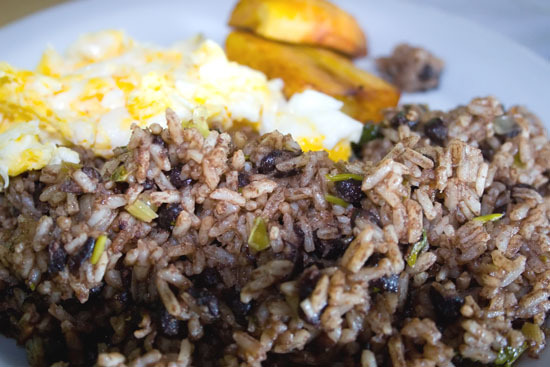 Gallo Pinto, the basin ingredients are rice and beans, is perhaps the most famous of all Costa Rica foods and is served mostly as a breakfast dish, but also for other meals or even as a snack. However, it is the seasoning ingredients that make the dish! The key ingredient in her Gallo Pinto, or for that matter a large number of Costa Rican typical food dishes is Salsa Lizano. This dark brown sauce has a pretty unique flavor, and not a few tourists have loaded up on it before returning home. The problem, of course, is that they run out! That’s when I get the emails. So, I decided to add a small online store to The REAL Costa Rica web site that sells not only Salsa Lizano and Costa Rica coffee, etc, but a variety of other foods gifts, clothes (check out the baby clothes!) and even a Costa Rica flag. To get to the store, just click here. Then just click on the Salsa Lizano category. Of course there are also the usual books on Costa Rica, but I also threw in stuff like music and DVD’s as well as learning Spanish. Just for yucks, I also added references to Mexico, Nicaragua and Panama as I get a lot of email from people asking about those countries. All stuff is shipped from the USA. Enjoy!